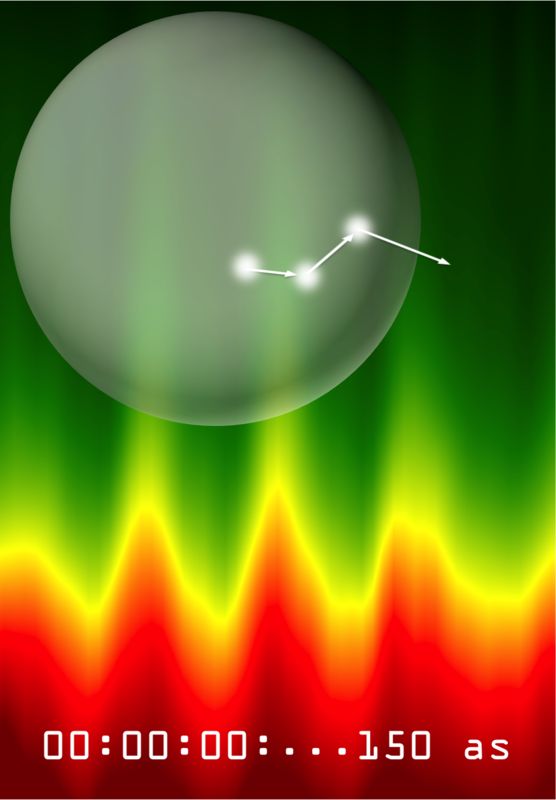 The research study 'Attosecond Chronoscopy of Electron Scattering in Dielectric Nanoparticles' has been conducted at the Institute for Photonics and Nanotechnologies of Milan (Ifn-Cnr) in collaboration with scientists from Politecnico di Milano, Ifn-Cnr Padova, the Hamburg Center for Free-Electron Laser Science (CFEL-DESY), the Laboratory of Attosecond Physics (LAP) at the Ludwig-Maximilians-Universität Munich (LMU), the Max Planck Institute of Quantum Optics (MPQ), the Institute of Physics at the University of Rostock and the Max. For this research study, extreme ultraviolet light pulses lasting only a few hundred attoseconds (billionths of a billionth of a second) have been exploited to ionize glass nanoparticles, causing the electron dynamics to be activated. Once ionized, electrons start to move and inevitably collide with atoms within the particle - either elastically or inelastically - thus giving rise to a random walk. Because of the dense crystal lattice, the electrons can move freely between each of the interactions for only a few ångstrom (10-10 meter). "This extremely short free path corresponds to a time interval of a few hundreds of attoseconds. For this reason, ultrashort laser pulses are needed to precisely clock the time between two consecutive collisions”, explains Prof. Francesca Calegari (Ifn-Cnr Milan and CFEL-DESY Hamburg). After a few scattering events, the electrons leave the material surface. The collisional dynamics increases the overall path, trapping the electrons for longer inside the nanoparticle. Employing a laser technique dubbed “Attosecond Streaking Spectroscopy”, the researchers managed to find out that it takes about 150 attoseconds on average - from the instant of ionization - for the electrons to be released. A sophisticated theoretical model, developed by the researchers at the University of Rostock, allowed an inelastic collision time of 370 attoseconds to be extracted from the measured time delay. The precise measurement of the scattering parameters is of crucial importance to retrieve the transport properties of the material. For instance, the suitability of the dielectric material to be used for a future ultrafast electronics operating at the petahertz speed could be in principle investigated. This worldwide first ultrafast measurement of electron motions inside a dielectric material could be also beneficial for medical applications. The human tissue is indeed considered a dielectric material, often modeled as “solid water”. The interaction of high-energy photons with the human tissue in radiotherapy inevitably leads to ionization and generation of electrons. These in turn transfer their energy via inelastic collisions onto molecules of the tissue, which can destroy it. Detailed insight about electron scattering is therefore relevant for the optimization of the treatment of tumors. “The scattering parameters retrieved from our measurements can be used in computer simulations to optimize the destruction of tumor cells in radiotherapy while sparing healthy tissue”, explains the researcher of Ifn-Cnr. The next step will be to replace the glass nanoparticles with small water droplets to study the interaction of electrons with the very substance that makes up the largest part of living tissue. L. Seiffert, Q. Liu, S. Zherebtsov, A. Trabattoni, P. Rupp, M. C. Castrovilli, M. Galli, F. Süßmann, K. Wintersperger, J. Stierle, G. Sansone, L. Poletto, F. Frassetto, I. Halfpap, V. Mondes, C. Graf, E. Rühl, F. Krausz, M. Nisoli, T. Fennel, F. Calegari, M. F. Kling.